H.P. Lovecraft's “New York Exile” of 1924–1926 was perhaps the unhappiest period of his entire life: living in a city whose giganticism and heterogeneity he loathed, unable to find work and forced to economize drastically on food and other necessities, and trapped in an uncongenial marriage, Lovecraft could only express his anger and despair in his work. 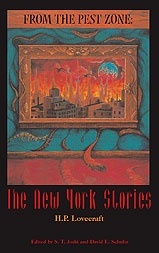 This volume, which gathers the five stories he wrote during this period, shows how Lovecraft sought refuge by returning imaginatively to his native New England (“The Shunned House,” “In the Vault”), lashing out at the many ‘foreigners’ occupying the city (“The Horror at Red Hook”), seeking the antiquarian havens that still remained in the metropolis (“He”), or boldly confronting New York’s clangor and stridency (“Cool Air”). Editors S.T. Joshi and David E. Schultz provide a lengthy biographical introduction as well as exhaustive notes to each story, supplying information on their background, influences, and use of the history and topography of New York City. As a result, these five stories present an underlying unity beyond their varied themes and locales: they show how Lovecraft came to terms with America’s only true megalopolis. S.T. Joshi and David E. Schultz are two of the leading authorities on Lovecraft. Together they have edited Lovecraft’s Lord of a Visible World, the Hippocampus Press edition of The Shadow out of Time, and other volumes. Joshi is the author of H.P. Lovecraft: A Life and other books; Schultz has edited Lovecraft’s Commonplace Book. Preface to The Shunned House, by Frank Belknap Long, Jr.
From the Pest Zone: The New York Stories. By H.P. Lovecraft, Edited by S.T. Joshi and David E. Schultz. New York, NY: Hippocampus Press; 29 January 2003; ISBN 0-9673215-8-1; Softcover, 150 pages.